Задача: Design an 8 foot tall, 360 degree Projection screen for T.J. Wilcox’ work “In The Air” exhibit for the Whitney Museum in NYC. Решение: Brackenbury used ten Optoma W306ST projectors for their unsurpassed short throw performance and intense immersive viewing capabilities. 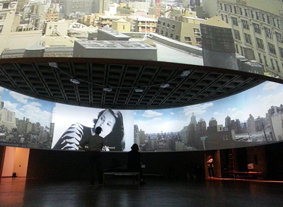 Результаты: "In the Air" premiered to rave reviews as a dazzling, one of a kind, panoramic projection exhibit.